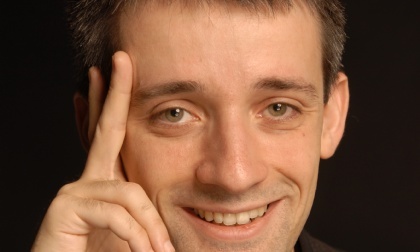 Alfonso Alberti is a widely active pianist in Europe and the US. Born in 1976 he has played in venues like the Konzerthaus in Vienna, Teatro Dal Verme, Milan, Teatro Bibiena, Mantova, Tonhalle Düsseldorf (Germany), the LACMA in Los Angeles, the Passionsspielhaus Erl, Tyrol, Austria and in the gardens of the Guggenheim Collection in Venice. Among the conductors he has played with are Tito Ceccherini, Gustav Kuhn, Vittorio Parisi, Arturo Tamayo, Flavio Emilio Scogna, Yoichi Sugiyama, Pierre-André Valade. He plays with the Ensemble Prometeo on a regular basis and occasionally performs with other Ensembles. He has recorded numerous CDs – both solo and chamber music (col legno, Stradivarius, Limen). His solo recordings include: Cangianti (music by Niccolò Castiglioni) and Dispositions furtives (music by Gérard Pesson). Together with the Orchestra della RAI of Turin he has also performed in a recording of Goffredo Petrassi’s Concerto per pianoforte e orchestra under Arturo Tamayo’s direction. Alberti works closely with the internet-television channel Limenmusic, for which he has done numerous music videos. One of Alfonso Alberti’s main focuses is the promotion of 20th century music, his repertory ranges from the historical avantgarde to young composers. He premiered solo pieces by Jacopo Baboni Schilingi, Paolo Castaldi, Osvaldo Coluccino, Giorgio Gaslini, Stefano Gervasoni, Giuseppe Giuliano, Daniele Lombardi, Alessandro Melchiorre, Fabio Nieder, Gérard Pesson, Robert HP Platz, Giuseppe Sinopoli, Alessandro Solbiati, Yoichi Sugiyama, Martino Traversa and several others. An enchanting piano world: the music of this sensual aphorist encompasses a range from a naively childlike tone to sharp-edged expressiveness. Dispositions furtives – A piano album perceptively hinting at possibilities to recall fading memories and lost times at the touch of a key, featuring Alfonso Alberti at the piano. In his interpretation of the music from Osvaldo Coluccino, Alfonso Alberti takes us by the hand to lead us part of the way through our innermost being.